It is that time of year that the Darts 🎯 season is upon us again. Please be aware that as a result, our food service will be restricted on Thursday evenings to allow access to the dart board. This will mean that some weeks the kitchen will be closed on Thursday evenings completely and others for reduced hours. If you wish to eat with us, please call in advance to avoid disappointment. Sundays – Please note that we only serve Roast Dinners on a Sunday. It is essential to book before our advertised closing time on a Saturday at the latest. We only prepare and cook enough food for those that are booked to ensure freshness and quality – we are usually unable to cater for extras on the day. Please phone in advance to book a table if you would like food. 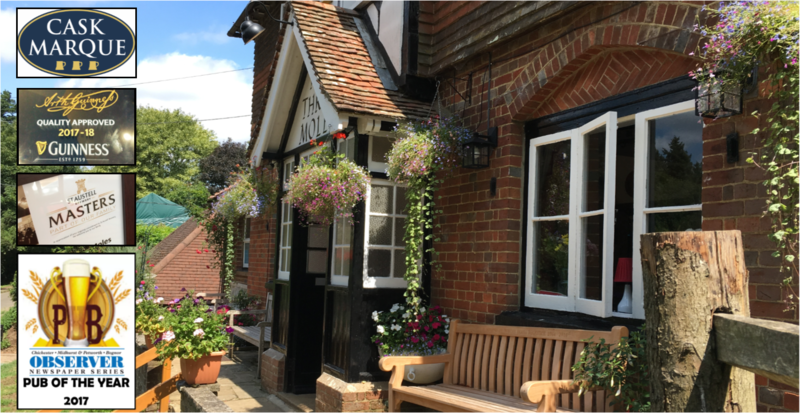 We are the smallest pub in West Sussex and have limited seating (3 tables indoors with more in the garden during the summer months). Particularly during the winter months we cater for events such as local shoots so food service will not be available on these days due to the numbers we are already catering for. During the shoot season (October to March) we have several private bookings for Friday afternoons so no food will be available – please call us in advance to avoid disappointment.